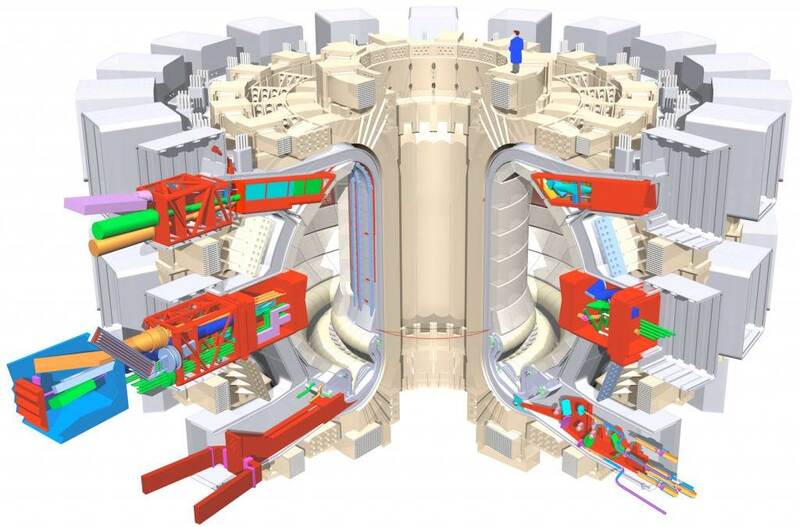 This detailed cutaway shows the buildings of the Tokamak Complex (Tritium, Tokamak and Diagnostics buildings, from left to right) and the seismic isolation system underneath the Complex. 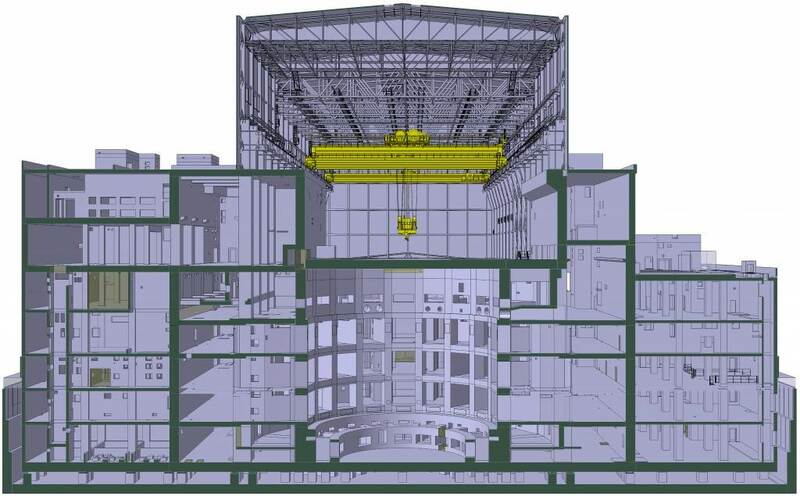 Once the Tokamak Building has been completed, and it matches the height of the Assembly Building, the temporary wall between them will come down and the rails for the heavy lift overhead cranes (in yellow) will be extended. 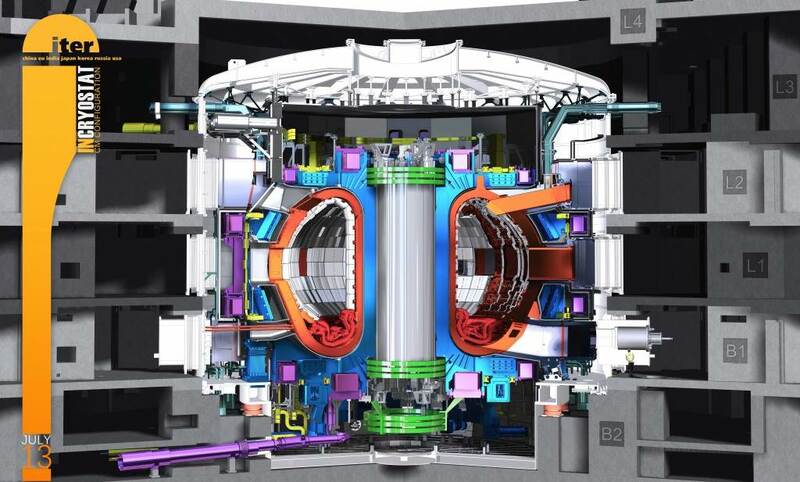 The Tokamak and its plant systems housed in their concrete home. 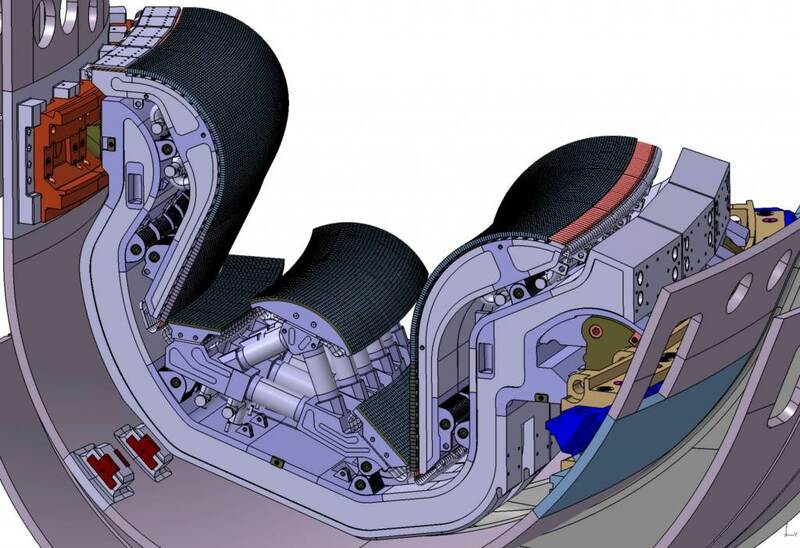 An estimated one million parts will be assembled in the machine alone. Image format: 72dpi - 4500 px width. The stainless steel vacuum vessel houses the fusion reactions and acts as a first safety containment barrier. It is a double-walled, hermetically sealed steel container that is equipped with 44 openings, or ports, to allow access for remote handling operations, diagnostics, heating and vacuum systems. 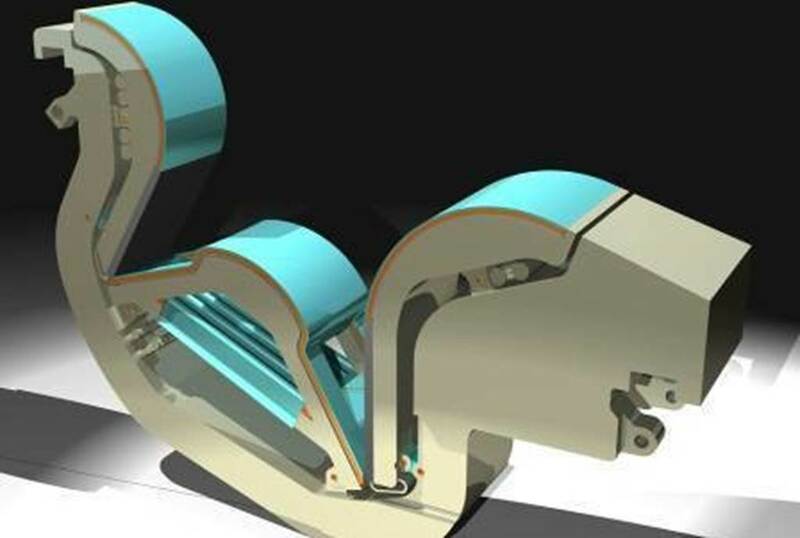 Six ring-shaped poloidal field magnets will surround the toroidal field magnet system to shape the plasma and contribute to its stability by "pinching" it away from the walls. 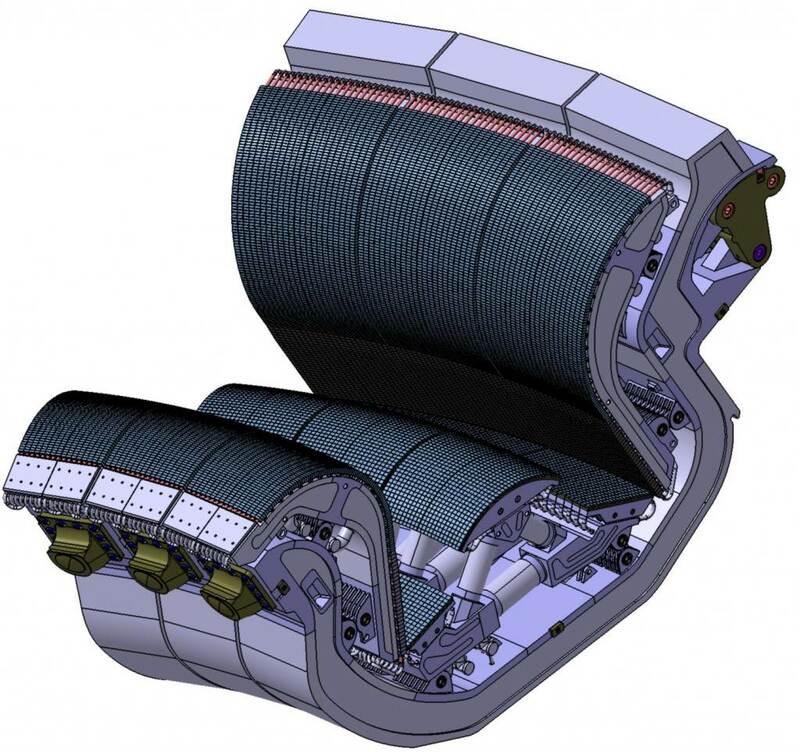 The largest coil has a diameter of 24 metres; the heaviest is 400 metric tons. 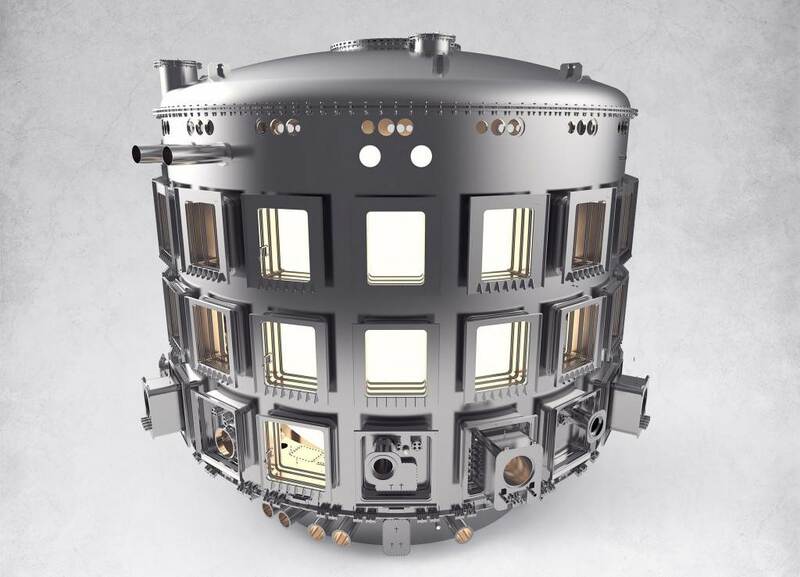 16,000 m³ in volume, 30 metres in height and as many in width—the ITER cryostat is not only one of the world's largest vacuum chambers, it's also by far the most complex. 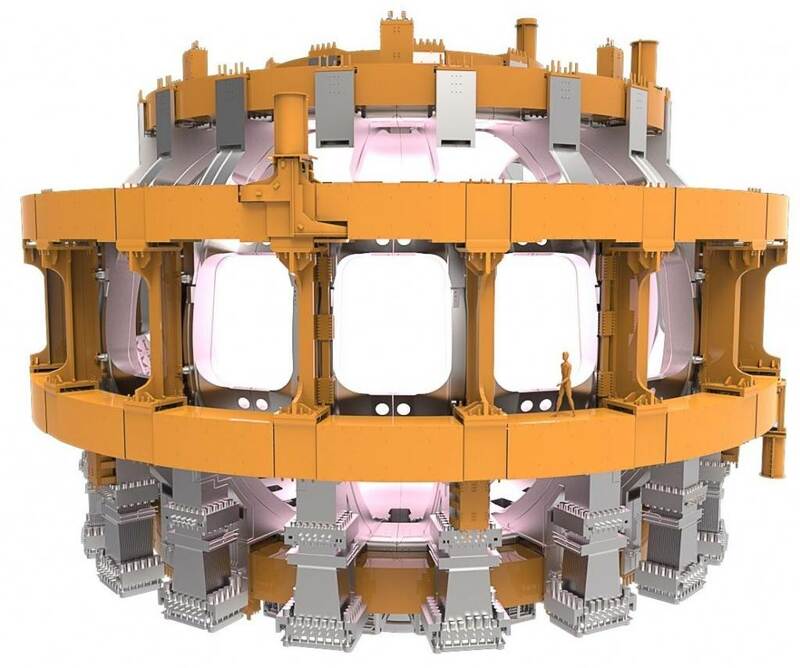 Six stories high, made of 800 tonnes of steel, two Sector Sub-Assembly tools will work in concert to equip the nine sectors of the vacuum vessel before their transfer to the Tokamak Pit. 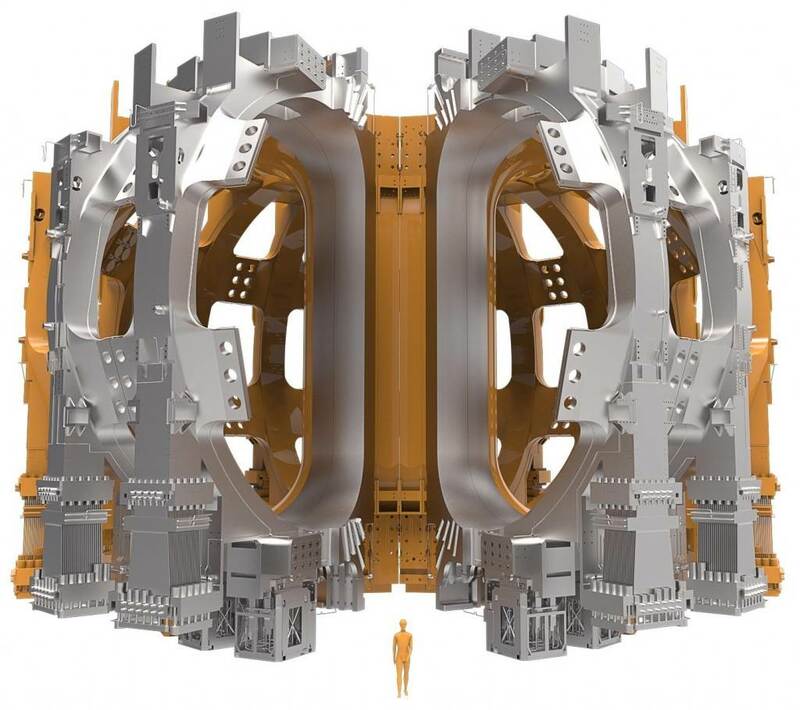 The seven-level Tokamak Building, which will house the machine and auxiliary systems, will sit five storeys (60 metres) above ground and two below. 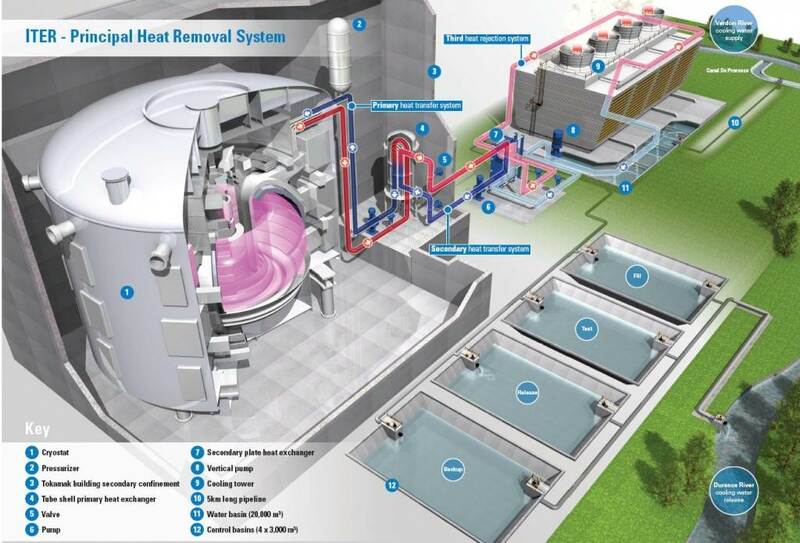 The Tokamak Cooling Water System includes major components such as pressurizers, heat exchangers, pumps, tanks and drying equipment, plus 33 kilometres of piping. 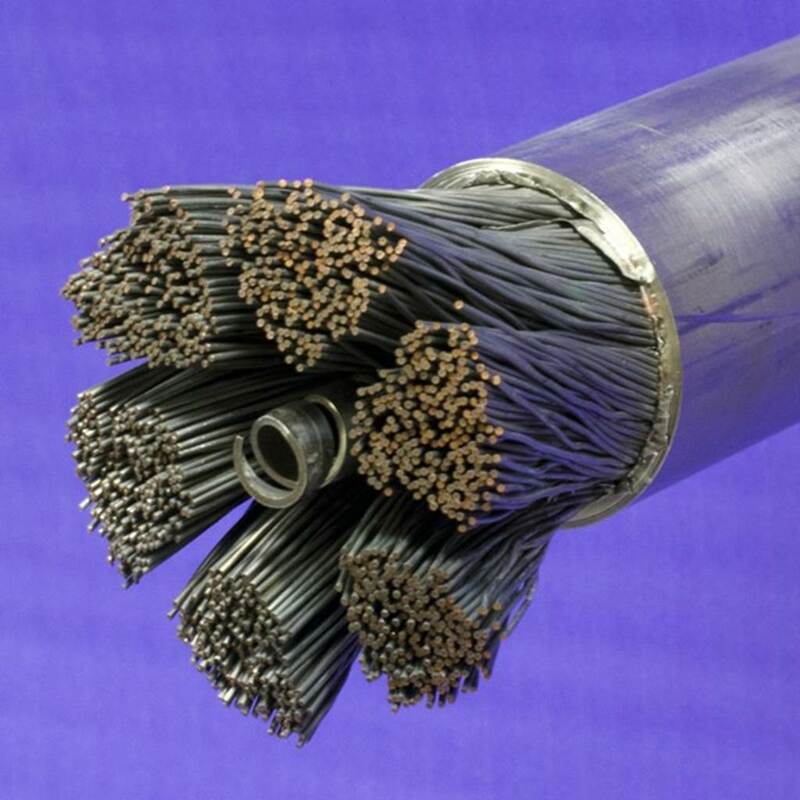 Jacketed cable for ITER's toroidal field conductor: superconducting and non-superconducting strands surround a central channel for helium. 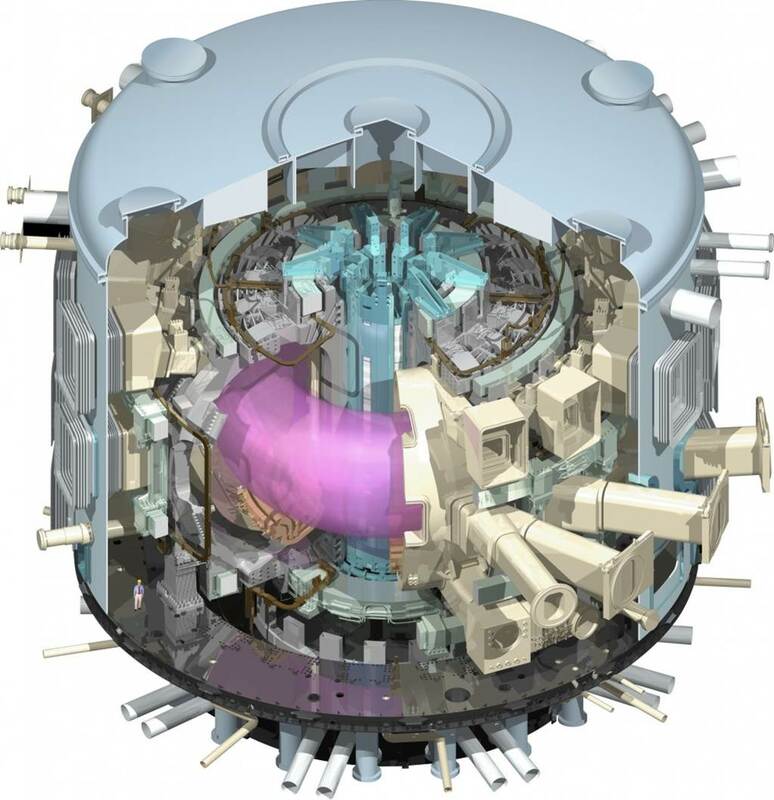 A poster of the Tokamak, "sans plasma"
The Configuration Management Model of the ITER Tokamak, without its plasma, produced by the Design Integration Section in July 2013. 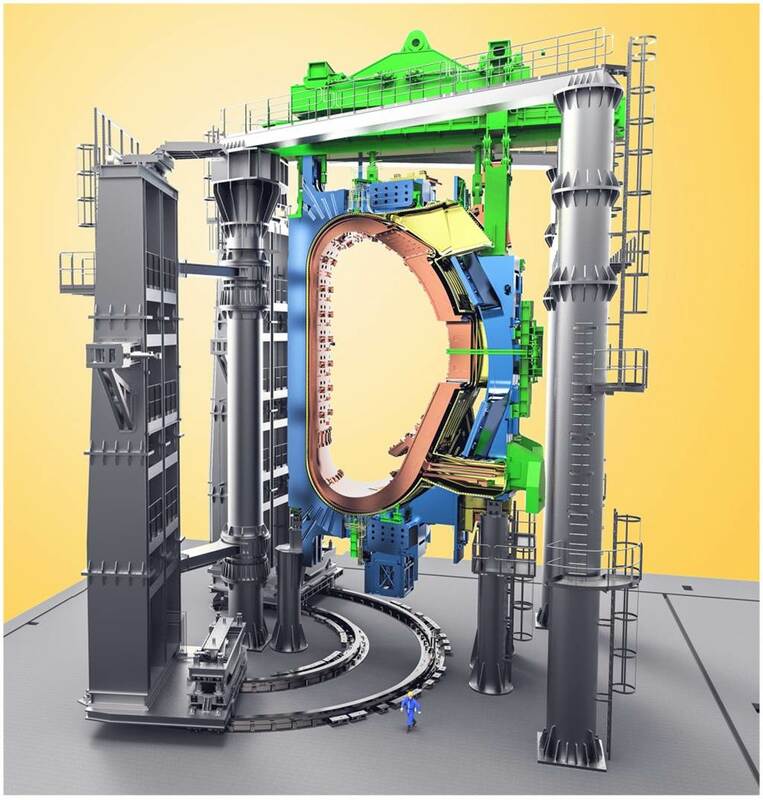 A poster of the Tokamak, "avec plasma"
The Configuration Management Model of the ITER Tokamak, with its plasma, produced by the Design Integration Section in July 2013. One of the two 45-ton ion cyclotron resonant heating antenna systems that will deliver 10 MW of heating power each into the ITER machine. 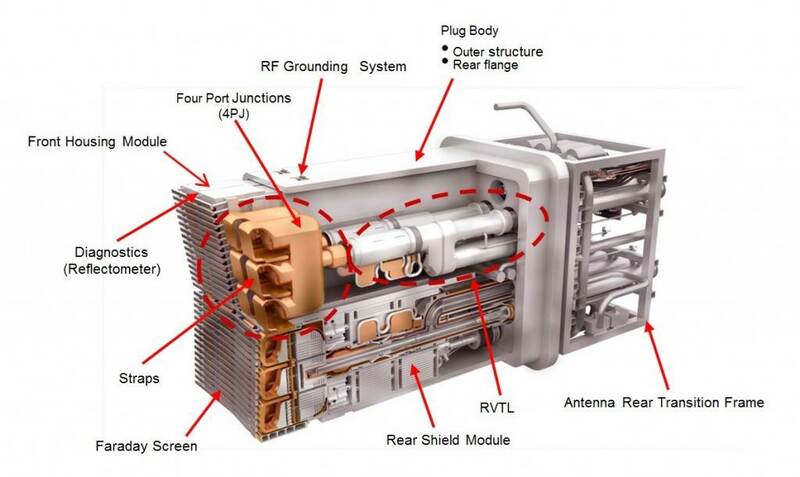 Forty-four openings, or ports, in the vacuum vessel will provide access for remote handling operations, diagnostics, heating, and vacuum systems. 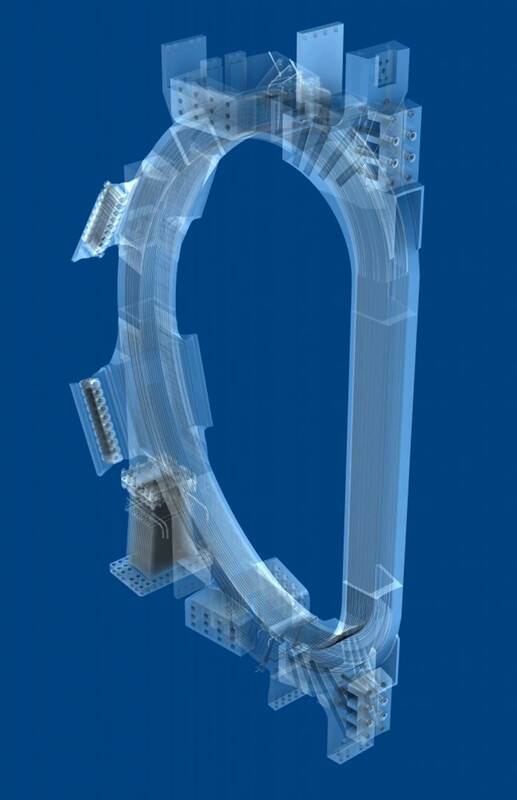 The central solenoid is the "backbone" of ITER's magnet system, allowing a powerful current to be induced in the ITER plasma and maintained during long plasma pulses. Thirteen metres tall, four metres wide and one thousand tonnes, it's also one of the largest components of the machine. 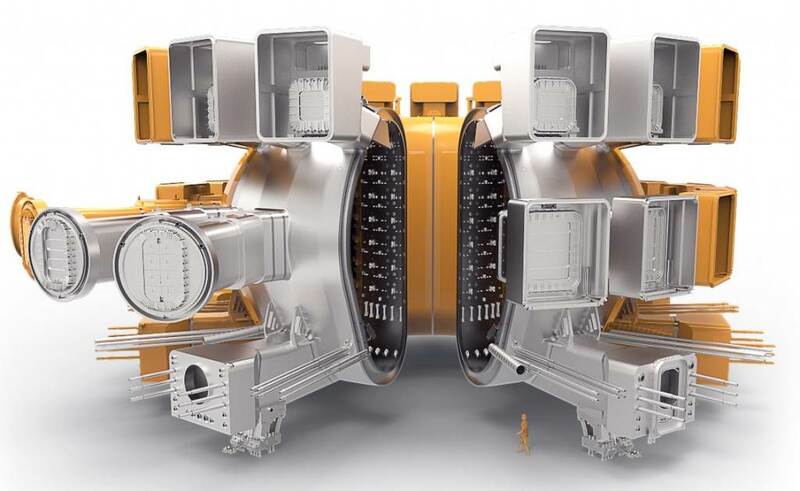 Positioned at the bottom of the vacuum vessel, the divertor controls the exhaust of waste gas and impurities from the reactor and withstands the highest surface heat loads of the ITER machine. 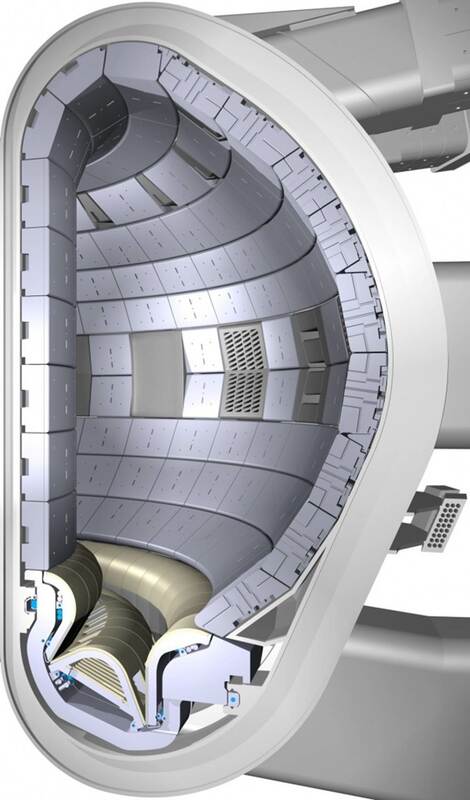 The three plasma-facing components of the ITER divertor: the inner and the outer vertical targets, and the dome. 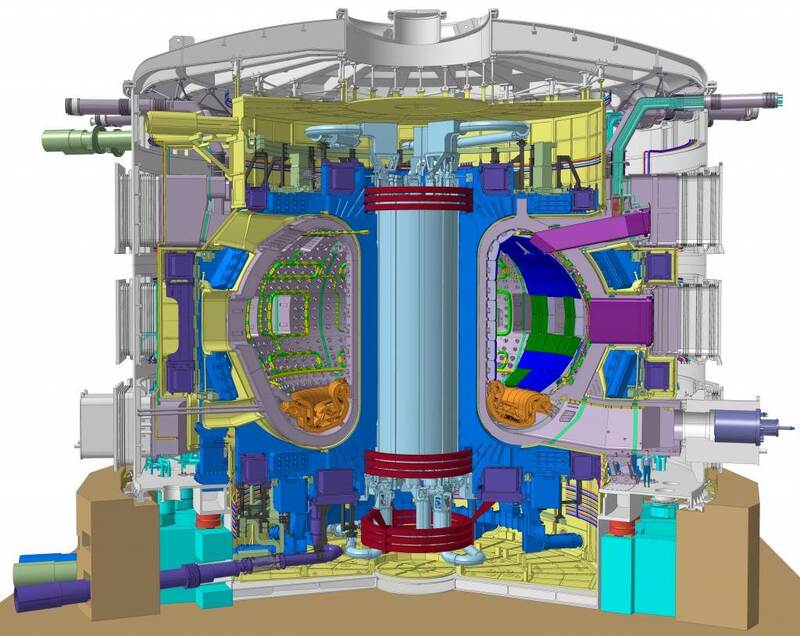 The targets are positioned at the intersection of magnetic field lines where particle bombardment will be particularly intense in ITER. 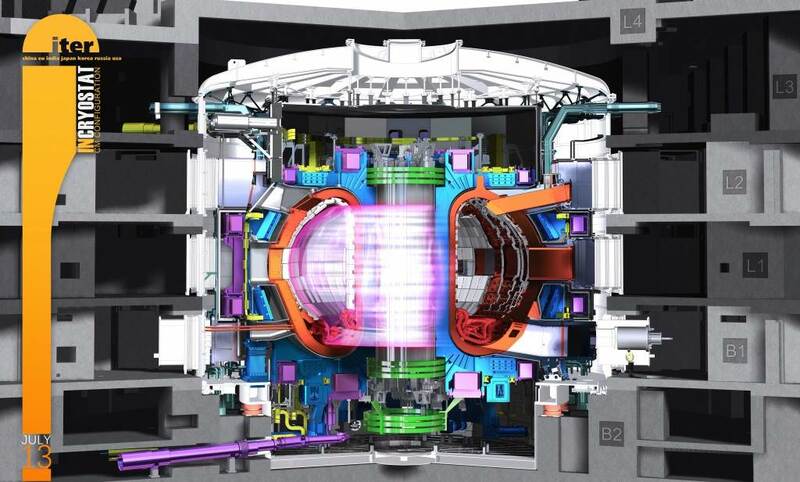 A cutaway of the ITER Tokamak, produced by the ITER Design Office in January 2013. 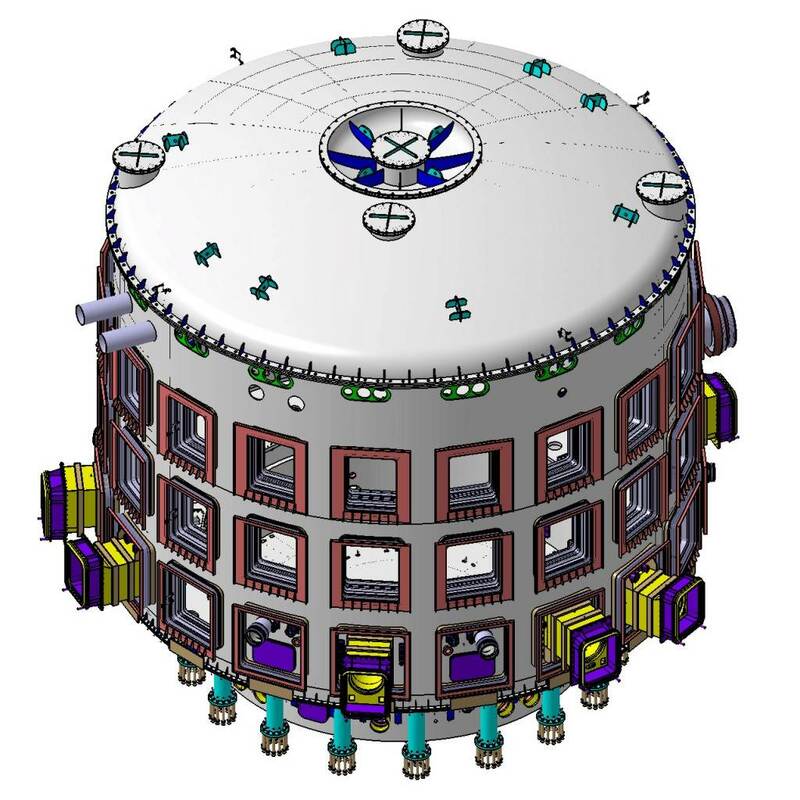 A cut-away of the ITER vacuum vessel showing the blanket modules attached to its inner wall and the divertor at the bottom. Eighteen of these toroidal field coils will surround the vacuum vessel and produce a magnetic field to confine the plasma particles. Each coil is 14 metres high, 9 metres wide, and weighs 360 tonnes. 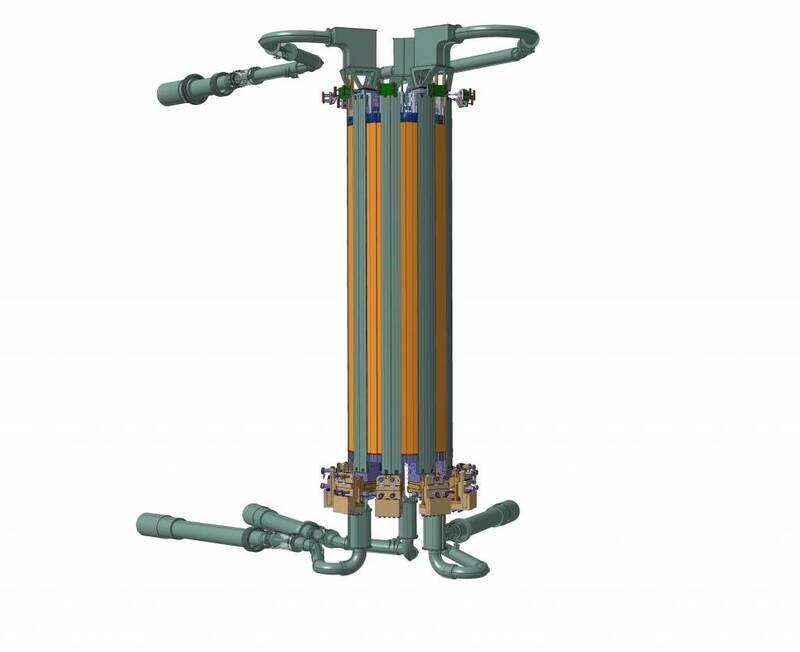 Situated along the bottom of the vacuum vessel, the function of the divertor is to extract heat, helium ash, and other impurities from the plasma. The 54 divertor cassettes are composed of a supporting structure made primarily of stainless steel, and three plasma-facing components: the inner vertical target, the outer vertical targets, and the dome. 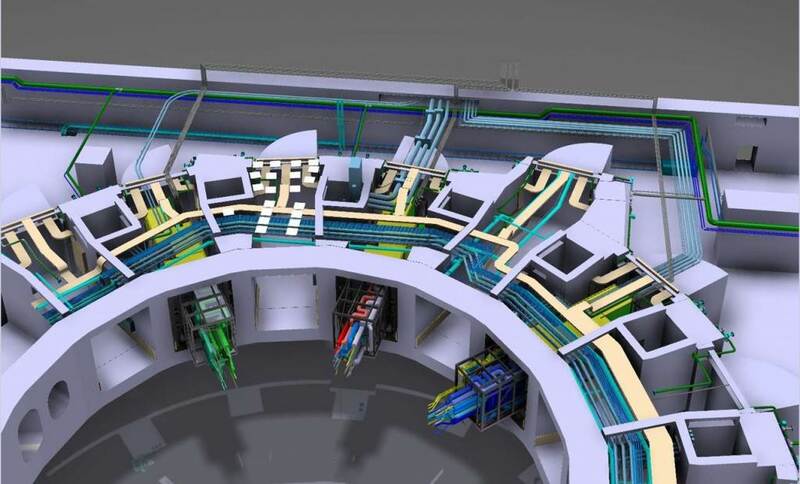 About 50 individual measurement systems will help to control, evaluate and optimize plasma performance in ITER and to further understanding of plasma physics. 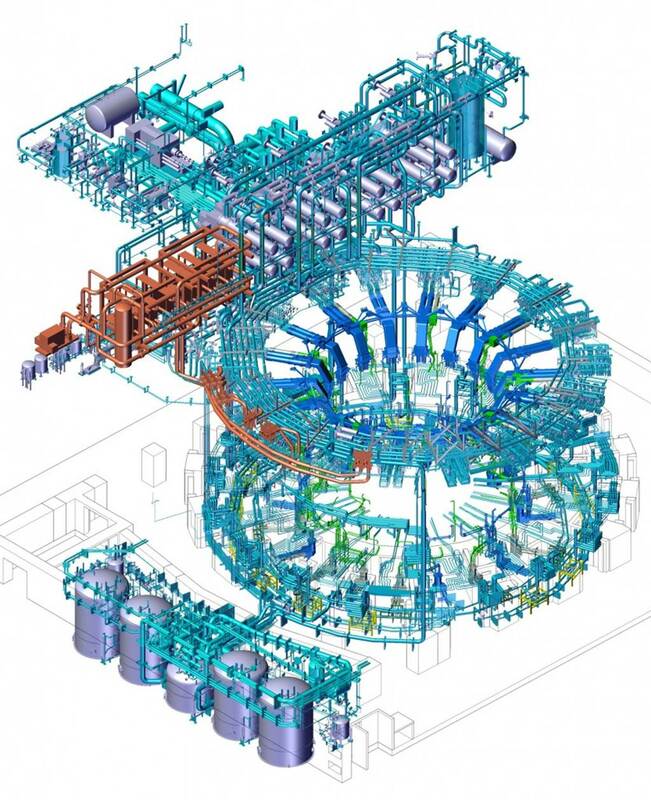 Welded together from thick stainless steel plates measuring between 40 and 180 millimetres, the ITER cryostat will completely surround the ITER Tokamak, forming the world's largest high-vacuum chamber. 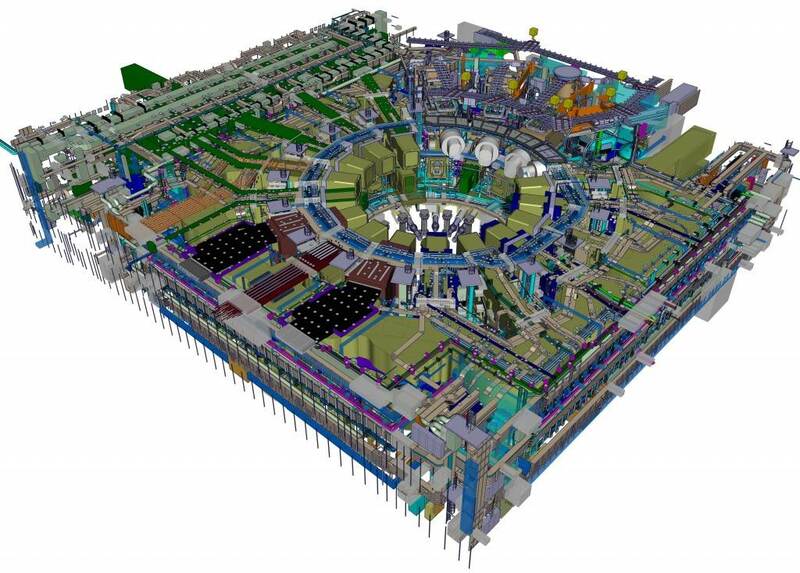 An isometric view of the plant systems that will support the ITER Tokamak. 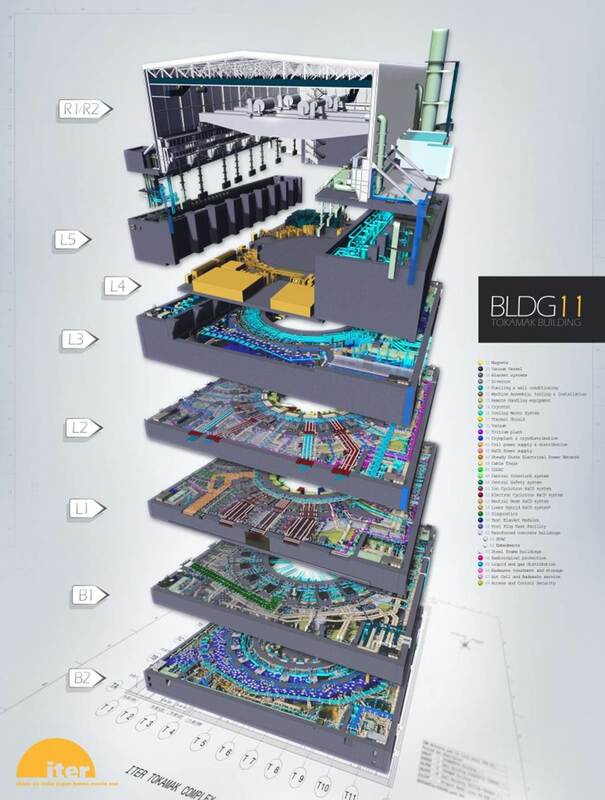 The Hot Basin and Cooling Tower Building at the top right of the diagram is part of the ITER Cooling Water System.